The Australian athletics team has kicked into action at the 2014 Commonwealth Games in Glasgow (SCO) in spectacular fashion, with Michael Shelley (Qld) running a superb race to win gold in the men’s race in a new personal best time of 2:11:15 and Jess Trengove (SA) clinching the bronze medal in the women’s marathon, also in a new lifetime best time of 2:30:12. Shelley ran an amazing tactical race and survived dropping off the lead group mid-race to pull ahead of Stephen Chemlay (KEN) in the latter stages to surge to a win that bettered his silver medal four years earlier in Delhi (IND). Shelley’s teammate Liam Adams (Vic) also recorded a new personal best time of 2:13:49 as he crossed the line in seventh place. Martin Dent (ACT) finished in 19th position in a time of 2:19:22. The men’s race started in damp and cool conditions, with light rain falling on the course. The Australian trio stayed with the leading pack early on. Through the first 10km, Adams was in third place in 31:31 with Shelley close behind (31:32 – 9th) while Dent was also not far adrift in 31:45 (20th). As the runners went through 15km, the Australian men looked to be losing touch with the leading pack which was dominated by African runners. Adams and Shelley dropped to the chase group forty seconds behind the leaders with Dent further back. When the pace slowed somewhat around the 25km mark, however, it allowed Adams and Shelley to rejoin the leading group of 11 athletes. Shelley went through 25km in 1:17:45 in fourth place, with Adams just a second further back in 8th. By the time they reached 35km, Adams had dropped off the pace but Shelley was right in contention. He passed 35km in 1:49:57 in seventh place just one second behind the leaders. Chemlay joined Ugandans Abraham Kiplimo and Solomon Mutai to put on a spurt shortly afterwards and Shelley responded. The four surged away from the pack but not long after it was Chemlay and Shelley who were left to vie for gold as they left the Ugandans behind. Chemlay tried to shake Shelley with another burst but the Queenslander maintained his composure. Shelley reeled in the Kenyan and promptly surged to the lead himself. 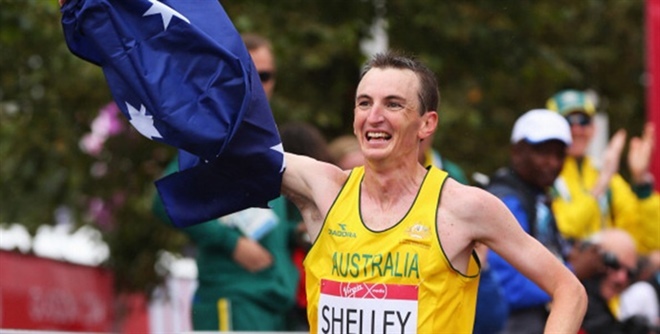 Shelley’s buffer grew to 43 seconds by the 40km mark and he confidently strode to victory to the delight of the many Australians in the crowd. “I’m still pinching myself, it’s very exciting,” Shelley said. In the women’s marathon, Trengove joined fellow Australians Melanie Panayiotou (QLD) and Sarah Klein (VIC) on the start line 30 minutes after the men got underway in slightly better conditions, with the rain having largely disappeared. Shortly after the 15km mark, Kenyans Cheyech Daniel and Caroline Kilel decided to test the field as they approached a drink station. They upped the tempo and quickly burst to the front with only Helailia Johannes of Namibia able to keep up. Trengove dropped away from the trio and went through 20km in 1:11:16 in fifth place, 37 seconds behind leader Kilel. The South Australian refused to be rattled however and worked hard to maintain contact with the fourth-placed runner in front of her, Canadian Lanni Marchant. Trengove eventually swept past the Canadian and, when the third-placed Namibian started to slow, she set her sights on reeling her in as well. She subsequently surged past Johannes and into the bronze medal position. The Kenyans went one-two, with Daniel taking gold in 2:26:45 and Kilel silver in 2:27:10. Trengove crossed the line in 2:30:12 to clinch bronze in a new personal best time. Trengove’s teammates also both recorded new PBs, with Panayiotou finishing in eighth place in 2:35:01 and Klein tenth in 2:35:01. “This is the most emotional I have ever been after a race, and I’m not sure why that is. I know that I am very excited,” Trengove said. Stay connected with the Australian athletics team by interacting with the Commonwealth Games Event Hub on athletics.com.au, or by joining the conversation on Twitter by following@AthsAust and using the hashtag #Glasgow2014. For more information on the Commonwealth Games, including the competition schedule, please click here to visit the Glasgow 2014 website.